There are many versions of the story of Faust, who trades his soul with the Devil for youth and power, but Gounod’s opera remains one of the most constantly enthralling. Michael Fabiano stars as Faust, with Diana Damrau as his beloved Marguerite and Erwin Schrott as the diabolical Méphistophélès. If you love drama, then this camp is for you! 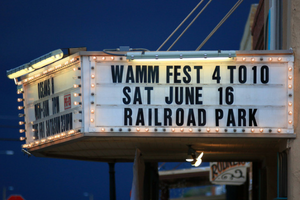 Experience acting, vocal technique, movement, improvisation, monologues, stage movement, theater games and activities and culminating in an ARTSRAGEOUS Showcase during the WAMM Festival! Brown-Bag Your lunch or choose our lunch option at checkout. Note: No special dietary needs or requests. $125 or $160 with 5 lunches included. Music by Domingo DeGrazia and Beth Daunis of Tucson and Compass & Cavern from Denver, Colorado. Art and fun activities for all ages and a showing of The Lego Movie outdoors in the evening. Enjoy an old-fashioned summer afternoon in the park! Make great videos! Get experience both in front of and behind the camera, plus video editing and the all-important movie poster. A Red Carpet premiere will follow. A summer camp for big people! Make great videos! Get experience both in front of and behind the camera, plus video editing. Discover photographic styles, automatic vs manual camera use, composition, tips for outdoor and indoor photos and more. Basic photo editing techniques in color, contrast, light and filters to create the exact exact effect you want. Learn about the settings on a DLSR and most digital cameras. From ISO to Aperture. We will also cover photo composition and how to get a great shot! Photo Editing. Come learn how to transform your photos from good to great! Many events allow for ticket purchases on-line with e-delivery.